It’s that time of year again when we see nothing but a steady stream of pink products, promotions and promises leading into October, National Breast Cancer Awareness Month. 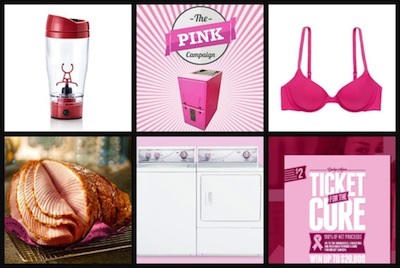 Below is just a sampling of what you’ll find on our 2013 Breast Cancer Cause Marketing Pinterest Board. We’ll be pinning through October so check back often! HoneyBaked Ham will replace its iconic gold foil with pink for the first time ever this October to support the National Breast Cancer Foundation (NBCF). One dollar from each limited edition pink foil-wrapped ham will benefit the NBCF. In addition, customers can participate in “Friends Foiling Breast Cancer Fridays” at HoneyBaked locations. Customers that wear pink and bring a friend for lunch on Fridays in October will receive buy one, get one free sandwiches. All month long, customers will have the option to add a donation of one dollar or more to their purchase, directly benefiting the NBCF. For the fourth consecutive year Aerie and Bright Pink will run an in-store and online campaign from September 18th through the month of October. Aerie will launch a limited edition Bright Pink Bridget™ Bra with 100% of the $29.95 sales price benefitting Bright Pink. Additionally, customers will be invited to “round up” their purchases in stores, to benefit Bright Pink. For donations of $5 or more, customers will receive a gift with donation Bright Pink nail polish while supplies last. The Illinois Lottery introduced the 10th edition of its breast cancer awareness instant lottery game, Carolyn Adams Ticket for the Cure. Since 2006, Ticket for the Cure has raised more than $9.8 million to support breast cancer research, awareness and education in Illinois. Net proceeds from the sale of the ticket are distributed by the Illinois Department of Public Health, which provides grants that fund medical research centers and community organizations across Illinois. The ticket launched this year is expected to raise an additional $1 million in funding. Although it’s probably too early to start prognosticating about the trends of Pinktober 2013, we’ve certainly seen the pink-creep beginning in late summer, with this October celebration fully underway by mid-September. With pink solidly on the radar of the likes of the New York Attorney General, we’ll be interested to observe just how closely these campaigns stick to the AG’s guidelines created last year. Want to pin to our 2013 Breast Cancer Cause Marketing Pinterest Board? Drop us a note to be added as a contributor.